SHUNMI recognized by ZAGAT, World’s Best Restaurant Guide. The Japanese Super Dining Restaurant ‘SHUNMI’ at Novotel Ambassador Gangnam has been selected as one of the best restaurants in Seoul by ZAGAT, the world’s most authoritative restaurant guide. ZAGAT, based in New York, is a globally reputed publishing company on travel & leisure guidebook and online content. The ZAGAT review started in 1979 when the two Yale graduates Tim Zagat and Nina Zagat reviewed and scored on restaurants they visited. The ZAGAT survey is currently done by the public guests on restaurants in over 100 countries on various criteria including taste, atmosphere, service, etc. The survey also includes judgment from experts to make the total score of 30. Being guest-oriented survey rather than expert-oriented one, the ZAGAT survey is known as ‘the latest integrated and trustful guide’ by major media while providing global map of gourmet restaurants. 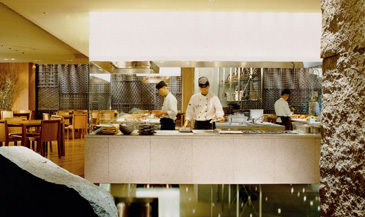 The 31 luxury hotel restaurants were included in the review while SHUNMI was one of 8 Japanese restaurants. SHUNMI had scores of over 20 in taste, atmosphere and service. Restaurants with scores of 20 or higher include Sushizo at Westin Chosun, ‘Ariake’ at Hotel Shilla, Akasaka at Grand Hyatt, ‘Momoyama’ at Lotte Hotel. Also, Kenji at Hilton Hotel, Tenkai at Grand Hyatt and Hanazona at Ritz Carlton were introduced as recommendable Japanese restaurants. ‘It is a great honor for us to be acknowledged by a world glass restaurant review. SHUNMI will continue to lead the culinary culture of Seoul with utmost services and tastes’ said Mr. Lee Wan-gi, F&B manager at Novotel Ambassador Gangnam. SHUNMI, referred to ‘summit of taste’ in Japanese, is aiming to become the trendiest Japanese restaurant in Seoul with eco-friendly interior design combined with authentic Japanese cuisine touched with modern culinary sense. The restaurant will go under renovation from early March to offer a new Sushi and Sake corners.